Most neighborhoods aren’t square or rectangular, unless you’re in New York City. There the streets create some very neat long blocks and short blocks, easy to draw a normal rectangular shape around for searching purposes. However, for the rest of us, we’re working real estate markets with a number of geographic, neighborhood, subdivision, and governmental land areas that simply aren’t shaped like a box. So, if we want to help our site visitors in their IDX searches to cover a specific area, how are we to do that, especially if it isn’t defined by a specific zip code or neighborhood name? One excellent example is waterfront property. Sure, there’s probably a designation field in the MLS for “waterfront” or something similar. But what if we want waterfront or water view, and we’re trying to cover several subdivisions or neighborhood designations? 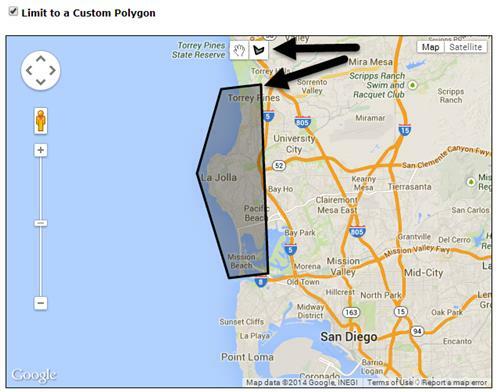 Let’s do an example on the west coast around La Jolla, CA to see how we can create a polygon shape for limiting a search area. In the Create a New Custom Link tool, we can use the two small icons at the top arrow, the hand to move around the map, and the black arrow shaped icon to draw a custom shape. Of course, we can also zoom in and out to get precisely the area we want. Once we save our link, we can use it anywhere in our navigation or in text on our site to help our visitors to zero in on the properties they really want to see. Ready to give our Mapping IDX a try? Click here for a free trial!